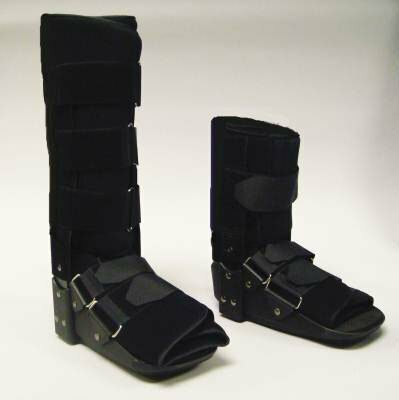 MediChoice's Low Profile Fixed Ankle Walkers provide treatment of stable fractures and ankle sprains. The walkers feature a deluxe foam liner designed for greater patient comfort as well as a wider footbed. The lightweight design includes contoured, metal reinforced uprights for greater strength and a more anatomical fit at the calf. Low profile, continuous arching rocker design promotes a smooth, energy-conserving gait, and a cushioned heel for greater energy absorption. A padded strap is included for optional padding at ankle. Size extra large. MediChoice is Owens & Minor's brand of medical-surgical products and durable medical equipment that is expanding to meet the changing needs of healthcare. MediChoice, your choice for quality, value and unmatched service. Search MediChoice for additional product offerings.